I had 14ers on the brain, but the unchecked peaks were too far for a day trip, and Brian couldn’t get away for an overnighter. 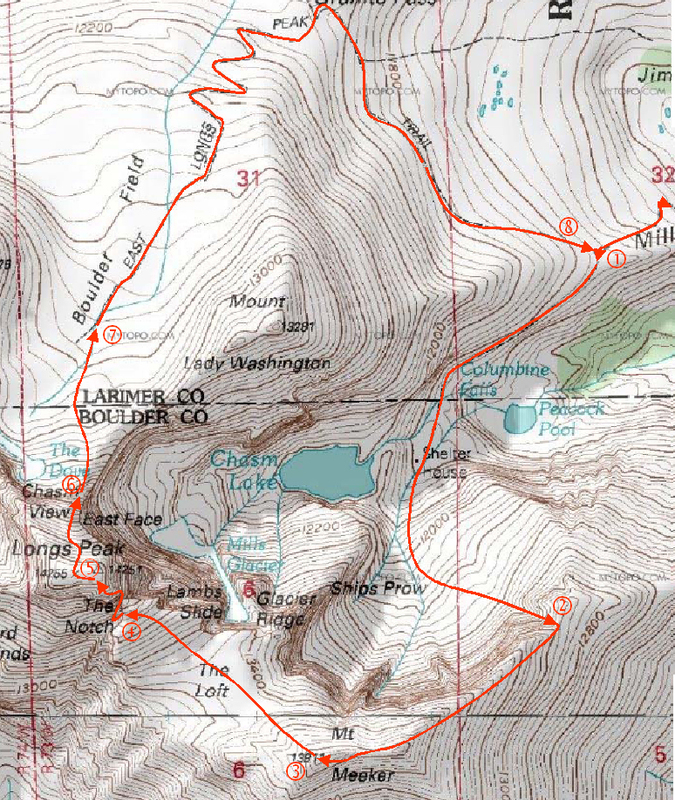 Brian suggested we do “Atlantic” as it is nearby (near Copper Mountain) and would provide a good ski descent. We could also add in Pacific if we made good time. I agreed. And everything started off so well…. We left the Mayflower TH parking lot around 7am and made good time along an old mining road. 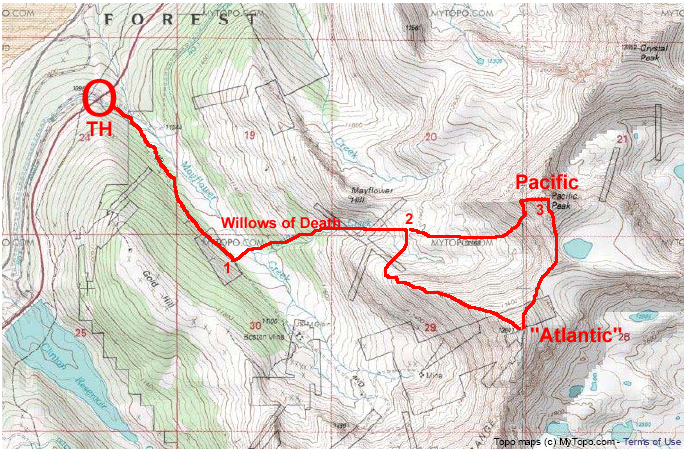 After about 1 mile we turned to head NE up a stream bed headed between “Atlantic” and Mayflower Hill toward Pacific Mt. Before leaving the road, I put on my snowshoes for floatation, which I brought instead of skis to give my aching knees a rest. My optimism was not well founded, but at least I could blame this one on Brian. Oh, the soft snow misery! If only I was postholing…but I was drowning. I needed snowshoes the size of freight trains. The snow was at least 5 feet deep and soft as far down as I dared during my tank-less deep dives. I had fallen into a giant bowl of sugar and had move through it to find an escape. It took us 1.5 hours to travel ½ mile. It sucked, big time. 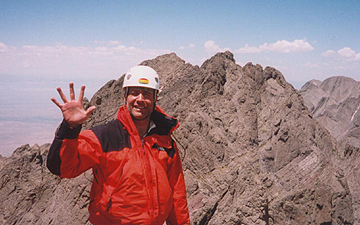 Finally, we reached the Atlantic-Pacific cirque and mounted the Atlantic West Ridge. I was ready for better conditions, but I wouldn’t find it. 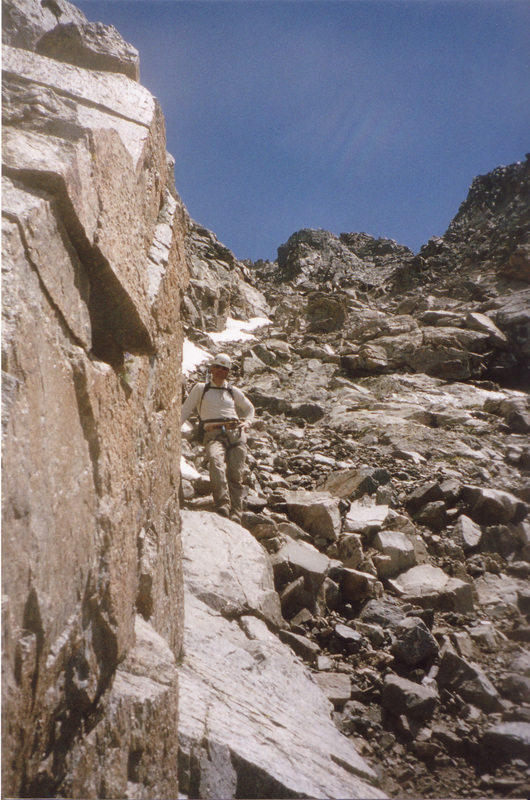 The ascent required a steep climb up a wall of loose rocks covered by thin layer of fresh snow. It was a slog. But at least the ridge proper was much easier, with a lower angle and exposed rocks for footing. We reached the Atlantic summit around 1pm. The wind was stiff and cold, but I needed a rest as well as some water and food. I sat on the eastern slope and ate my lunch despite a rather uncomfortable sitting position. 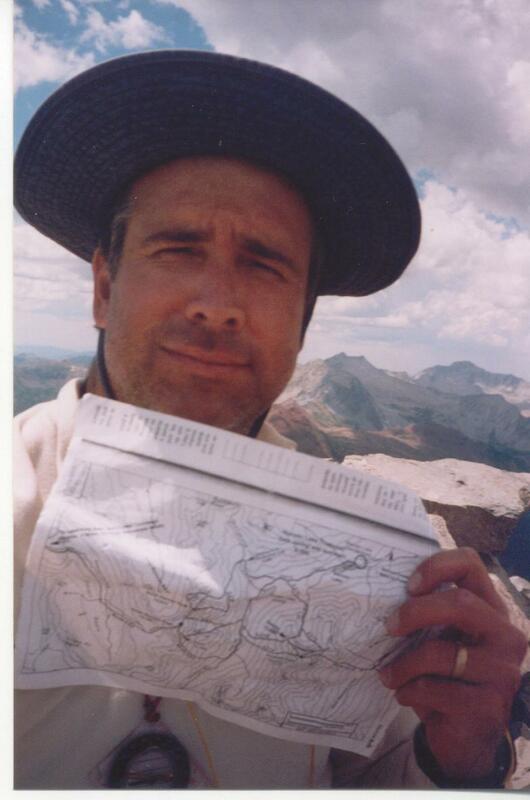 We decided to keep going to descend into the valley below from Pacific’s summit ridge. 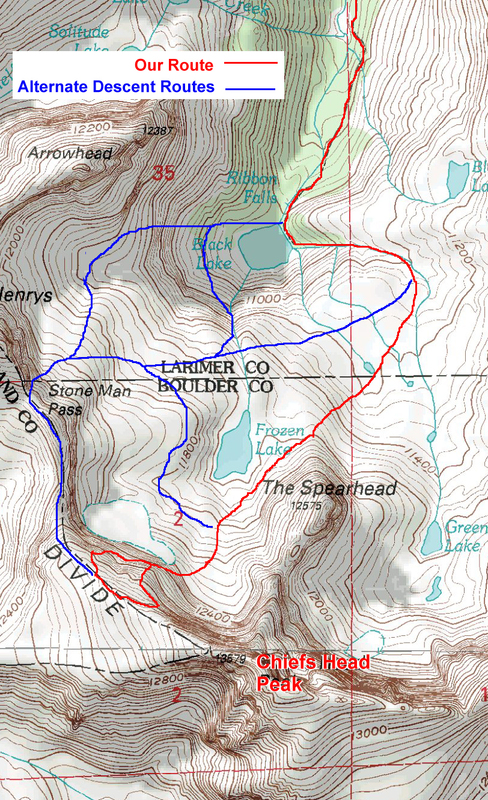 The ¾ mile traverse (and 400 foot altitude gain/loss) went quickly. The Pacific summit rose to a point, 2 feet by 2 feet…just as a summit should. Without a pause, we immediately turned down the west ridge toward a tongue of snow which would lead us to the foot of the mountain. Pacific is a twin-peak with no easy way to get down the west ridge. As we skirted the west (lower) town, I had to down climb a loose rock chimney. I stepped into the chimney putting my left foot on a questionable foothold. 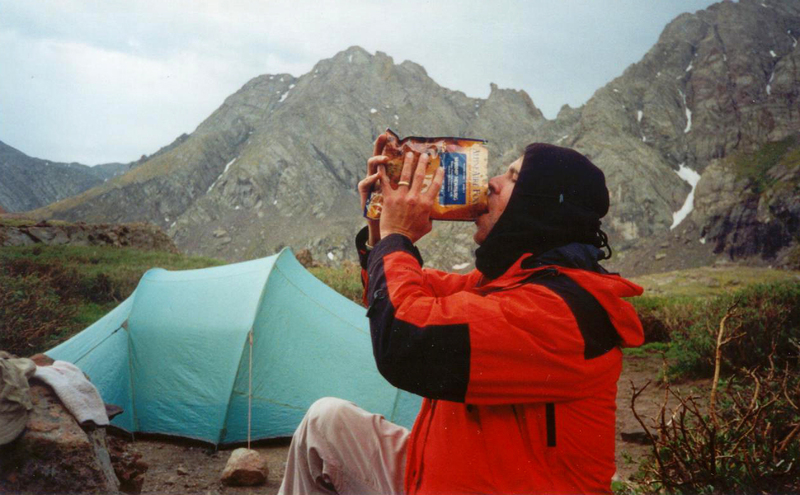 I proceeded only because I had good holds for both hands, although, my left hand also held my collapsed trekking poles. My right hand held a jug on a large detached block. 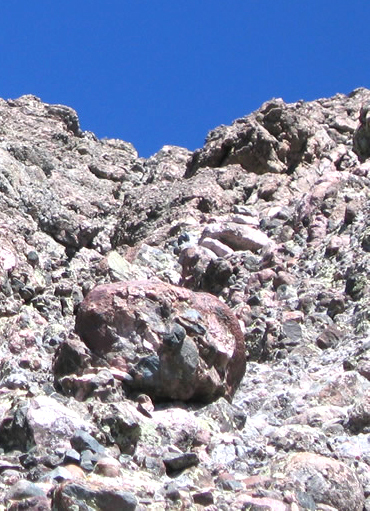 As I lowered myself to the next foothold, my only foothold failed…the rock broke off! As my weight suddenly shifted to my hands, my right hand hold failed. The detached block shifted and pulled out of its slot. My mind raced for options and a quick glance revealed no other holds. To buy a few milliseconds, I continued holding the detached block as it toppeled out and down toward my head. As I twisted to avoid the rock, I shifted my right hand from the falling rock up to the ledge where the detached block once rested. In the meantime (all 1.2 seconds of it), I traded a wrenched left shoulder and chest muscle for my life. Fairly quickly we reached the tongue of snow that reached to the valley below. The snow was a bit soft, but still allowed for a fun descent. I had a fantastic glissade off the summit ridge. Naturally, once we got down to the streambed, it was worse than before. The snow was hell. I tried to stay in my old tracks to find any purchase, but the snow had turned into quicksand. The snowshoes provided no floatation, but instead became anchors that would hook under any vegetation beneath the snow. I ended up taking off the snowshoes and just crawling back to the road….I didn’t know if I’d drown or go crazy first. When I finally reached the road, I just rolled onto it out of the snow…and then let loose a blue streak of curses until my remaining energy was exhausted. It was the worst experience of my life. But once I got back to the truck, it had turned into a great day! And after all these years, I finally started to get an inkling of what that Dickens fellow had been talking about. Ice Mountain had long been on my list of peaks to carefully and proudly summit. Many years later than I expected, I finally arranged a weekend trip to collect it and the other two Apostles. 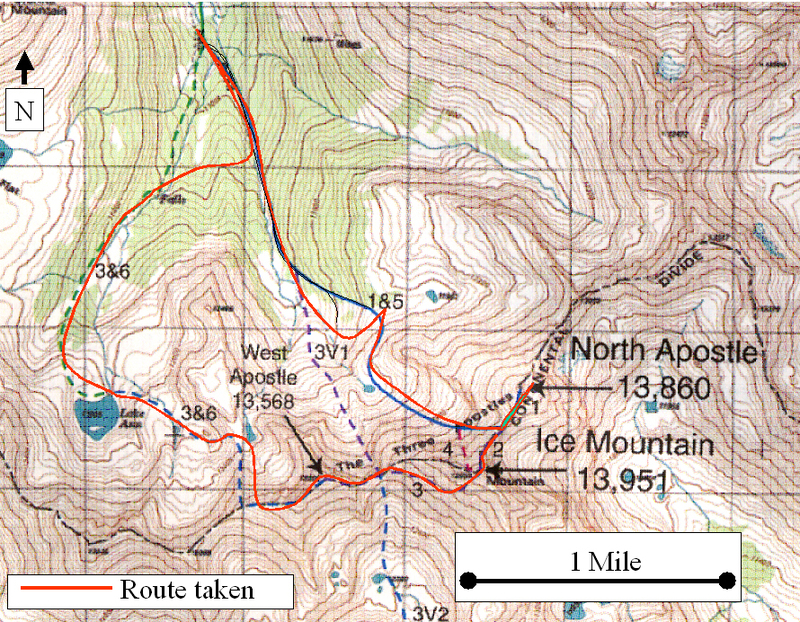 The plan was to get the Three Apostles (North Apostle, Ice Mountain & West Apostle) over the June 24-25, 2006 weekend, doing all three peaks on a single day. We met after work on Friday and drove to the 4WD trailhead for a few hours of sleep. We arose and left camp at approx. 5am on Saturday. It was a humid place (river, puddles, lakes: water everywhere) and the temp was around 30F. My small pack and a sunny day forecast convinced me to leave my bulky fleece in camp. And it was the right decision, but I did suffer for the 15 minutes it took to work up a full head of steam. Within minutes we reached the TH which had two trails: one was marked “Huron Trail” and the other one wasn’t. We started toward the 3 Apostle’s Basin (as best we could tell) at a very fast pace to work up some heat. 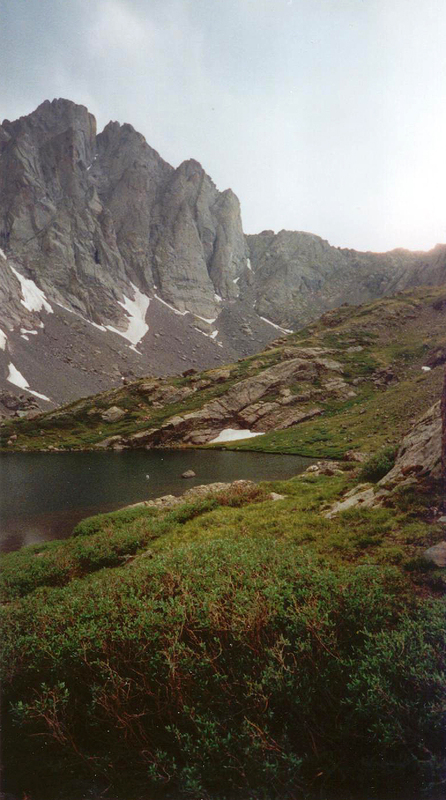 We stayed on the obvious trail until we came to a well-signed fork: Lake Ann (to the right) and Apostle’s Basin (to the left). The Lake Ann alternative immediately crosses a substantial footbridge. We went left and followed without difficulty a good trail (including a log creek crossing) to the terminal moraine between Ice Mountain and West Apostle. From the moraine there was no distinct trail, so we angled left toward North Apostle around the cliffs at the foot of Ice Mountain until we reached a lovely grassy ledge. From this vantage point, we were able to triangulate on a probable position using Huron and our map. Deciding that were below North Apostle, we angled back toward Ice Mountain up and into the couloir between North Apostle and Ice Mountain. It is very good to be lucky in the mountains, and we got very lucky and received a beautiful day. The moderate temperature and light wind made for one of the most comfortable approaches I’ve ever had. And the views of Mt. Huron and the surrounding peaks were awe-inspiring. A great start to a hard climb. I intended to stop for water at the tiny lake shown on the map at 12,100ft but we found ourselves 100 feet above it before we spotted it. 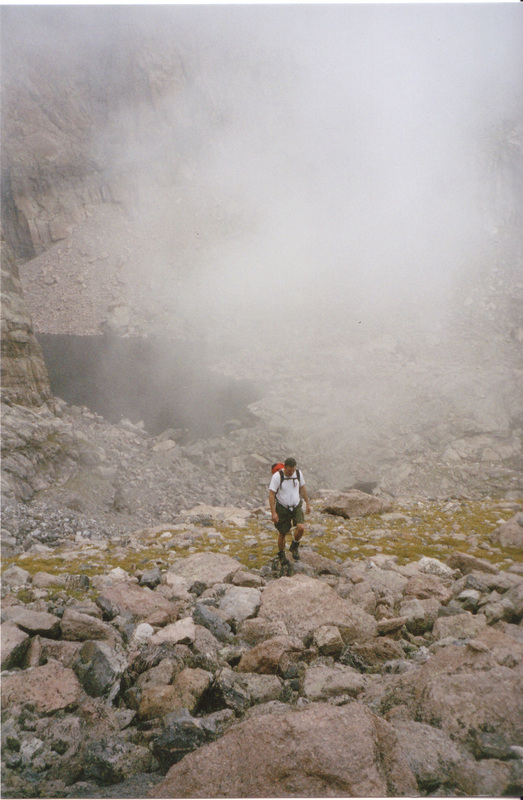 Rather than descend to get the water, we continued upward to some running snowmelt a few hundred feet higher, where I managed to slip on some ice and nearly tumble into a watery grave far below. We continued up past a snowfield extending down from a fine looking couloir that reach up to nearly the top of Ice Mountain’s Northeast ridge. 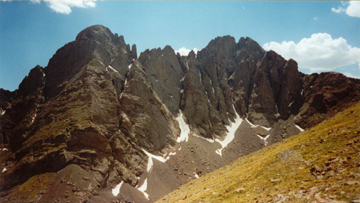 All that was left to reach the saddle between North Apostle and Ice Mountain (13,100ft) was a section of large & rather loose talus blocks. 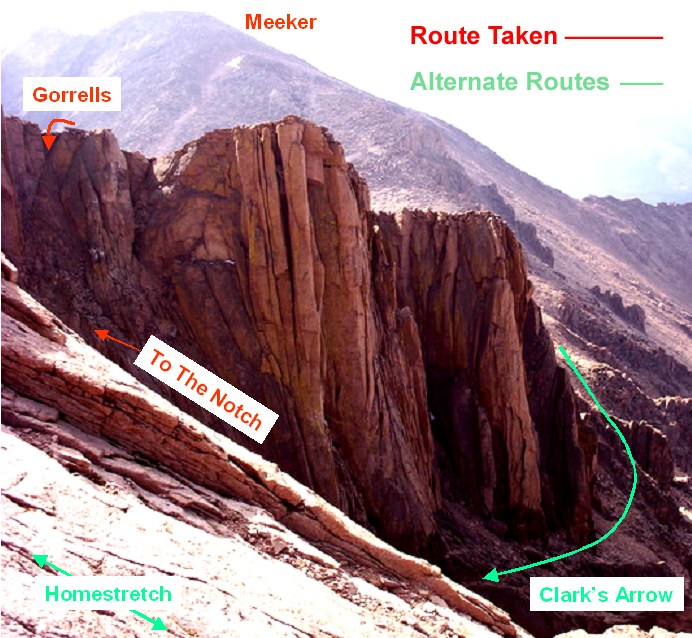 After a brief rest on the upper saddle, we hurried up and then down North Apostle with some very easy scrambling. And then we readied ourselves for the crux of the day…Ice Mountain. The plan for the day was to try to make the Ice Mountain Northeast ridge work and then bag West Apostle before heading back to camp. However, if the conditions were too dangerous, we were prepared to back off and reattempt from the much easier West Apostle side on Sunday. 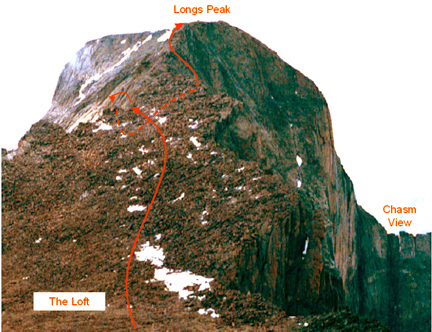 Naturally, we’d rather finish the three peaks in a single push to minimize the approach hiking. The route up the Northeast ridge was rather exposed but quite solid, and the path was well beaten most of the way. 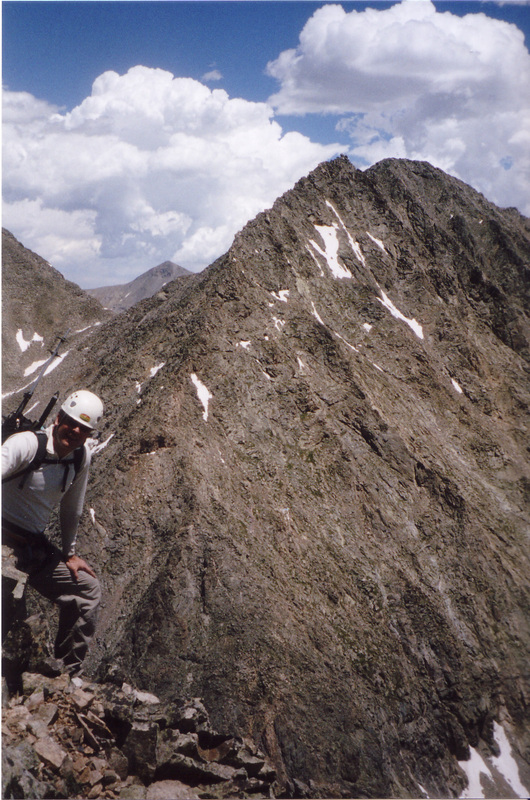 We reached the end of the climbable ridge and began following the directions we’d found in Roach’s 13ers Guidebook. The first step was obvious and only a little exposed; we had no trouble with it. But the second step was impossible as we could not find a “large block” anywhere. Brian thought the chimney straight overhead might go, but I wanted to continue to look for and follow the established route. We didn’t see any way to “climb the right side” of the couloir we were in, so we crossed over (right) to the next couloir (hoping it was the “right side”) and climbed up the horrid, loose, black rock which I’d grade as technical (low 5th class). On top of the technical difficulty, the rock was very loose. I had to test 5 holds to find one that I was confident in trusting with my life. 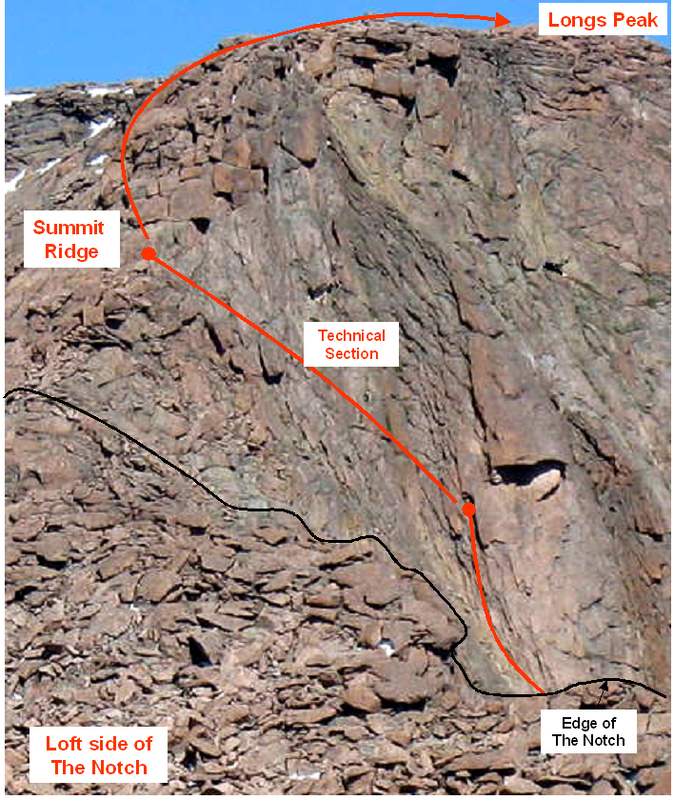 In hindsight, the chimney above the initial couloir we crossed when we left the ridge was probably the correct route. 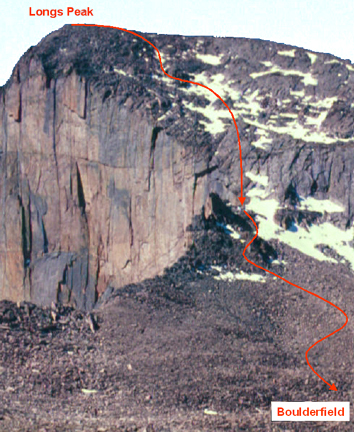 Our Loose-Black-Rock-of-Death route topped out at near the summit level, and we quickly reached the summit block at approx. 11am. It was borderline excessively risky, but we felt our rock climbing skills would be enough. Since it was only a moderate gamble, I was prepared to explain how it all ended. We rested a few minutes while pondering our route-finding difficulties, and then headed down the large gully that runs directly down from the summit to the West Apostle side. This gully quickly joins another gully that runs down from the crease in Ice Mountain between the real summit and false summit. The footing was more secure that it appeared or had any right to be, but still the descent was long and tedious. We continued down until the ridge to the right (descending climber’s right) got low enough to easily mount (also when the cairns begin). 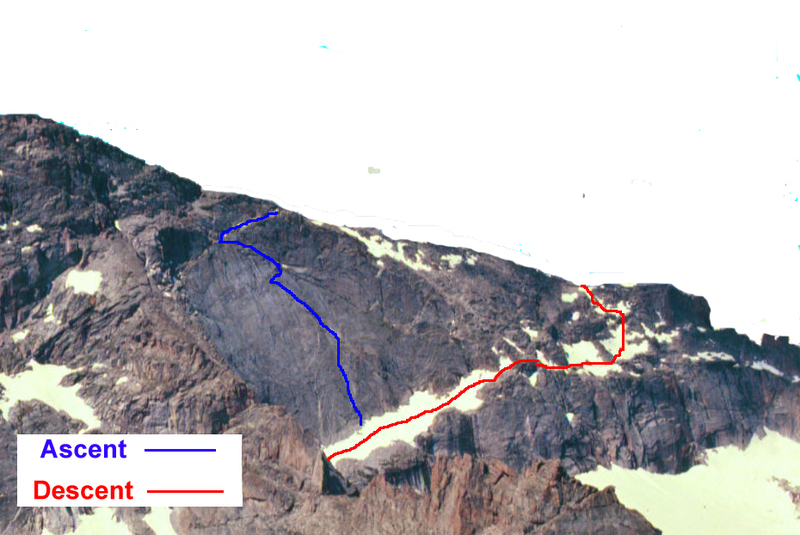 At this point, according to our route plan, we were supposed to do a descending traverse to the headwall on Ice Mountain above the saddle (now visible) between Ice Mountain & West Apostle. There is no clean line as such on this hill; we traveled in more of a descending zig-zag fashion, like the edge of a toothy saw laid on a declining angle. 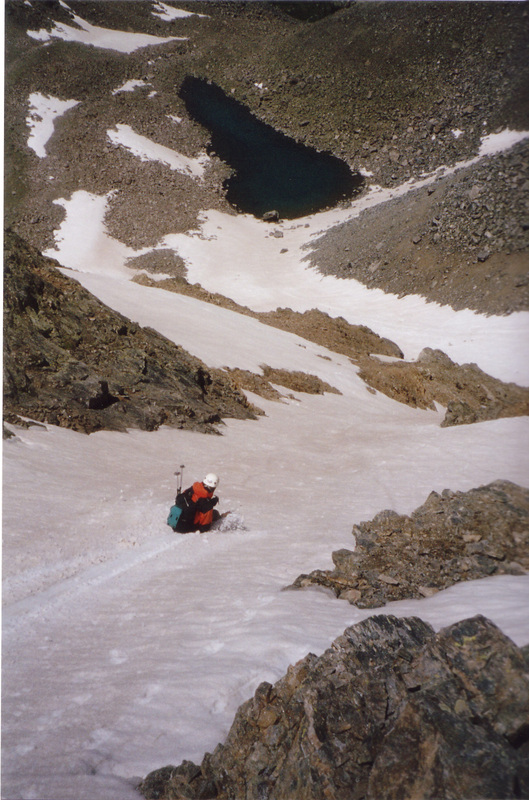 At least we had a solid idea of where we needed to end up, and so we just kept hopping gullies until we reached the headwall. And I managed to survive yet another stupid talus hopping mistake. At the saddle between Ice Mountain and West Apostle, we could see some dramatically steep snow descending toward the terminal moraine we skirted earlier that morning. The views stirred our imaginations about a fast descent, but we soon settled on the duty at hand. 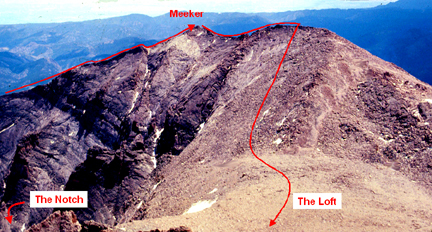 We had to climb up 500ft to reach the last of 3 summits on the day, and then still get down in one piece. I was very tired, but had a food bar and ½ liter of water to power me home. The remaining hike over and down West Apostle was the easiest ground of day. We got down to the far side of the West Apostle and found to our delight that there was enough snow left to use for our descent. I used a glissade to erase 700 feet in quick order, while Brian decided to plunge step, and practice his self-arrest technique a few times. Finally, we worked back toward Lake Ann and a much needed water re-supply. The rest of the hike to the TH/Camp was uneventful except for a couple horrible cases of fire-toes. Back at camp sitting in a camp chair with my boots off, and eating watermelon, fire roasted sausages, and re-hydrated spicy noodles was wonderful conclusion to a perfect day. Note: all credit to Brian for the camp pleasantries; I couldn’t be trusted to even bring a pillow for myself. On Sunday, we drove out through Winfield into Leadville for my annual breakfast splurge mingling with the regulars at the Columbine Restaurant. Instead of my normal Zone Bar breakfast, I splurged (artery-wise) on a 3-egg omelet stuffed with tomatoes, sausages, bacon and Swiss cheese, and a plate of breakfast potatoes with 2 pieces of toast slathered with butter and jelly. I enjoyed the meal fully and without reservation about any health impacts in a way that is only possible after a full-out, hard-core day of exercise and living fully.